If you are the network administrator of a Wi-Fi network deployment or if you want to set up a WLAN for your business, you should look for the right network monitoring software able to satisfy your needs. In a previous article, we wrote about WirelessMon and Ekahau, two well-performing software for Wi-Fi monitoring. Today, we have selected the 5 top network monitoring software in 2017 that, in our opinion, can help you monitoring your Wi-Fi network anytime. In this way, you will always be informed about the status of your access points and be able to avoid network problems that, otherwise, would undermine your Wi-Fi router’s correct functioning. What are the main features the right network monitoring software should have? Bandwidth monitoring, in order to check upload and download speed, the bandwidth utilization, the devices’ load percentage, and to avoid bottlenecks and connectivity problems. EventSentry is a tool to monitor any SNMP-capable device such as Linux servers, routers and switches using SNMP. EventSentry offers a status webpage useful to see which services are currently online or offline. Main features: real-time event log monitoring, real-time analytics, bandwidth monitoring. Pros: EventSentry is compliant with regulatory bodies like PCI, HIPAA, SOX, GLBA, FISMA and others. Price: After a 30-day free trial, for the first year you need to pay 1 license at a price of $84,00 (per each Windows device). 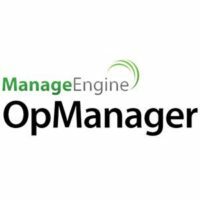 OpManager is a network management platform that allows large and medium-small companies to effectively manage and monitor their IT infrastructure. It provides a wide range of tools for monitoring networks, servers and data centers, and for the identification of performance issues. Main features: bandwidth monitoring and analysis, server monitoring, Internet usage monitoring, performance monitoring. Pros: OpManager is a platform that covers different areas at the same time, from networks, to physical and virtual servers, to event logs. The included dashboard enables you to monitor and track all connected devices in real-time. OpManager is used by well-known clients such as DHL, Siemens and even NASA. Price: After a 30-day free trial the starting price you need to pay can vary from $16,495 for large enterprises (limited to 500 devices) to $595 for small and medium enterprises (limited to 25 devices). Our easy-to-use, affordable cloud-based software for managing Wi-Fi networks and social hotspots allows businesses from various size to remotely monitor your access points and WLANs, all in one place: if an access point goes down, you will receive a customizable alert and you will be able to check its status from our centralized dashboard. Main features: network and access points statistics, bandwidth and load monitoring, real-time status of the access points, Internet usage monitoring, detailed analytics about your clients. Pros: remote monitoring, which allows you to save time and monitor in real time your APs being deployed in one place or in multiple locations worldwide; the Cloud Dashboard, accessible from any device: smartphones, tablets, laptops or desktops; remote monitoring plug-and-play. Price: 15-day free trial with all features included. The all-in-one plan for partners starts from $8 per AP per month + entry fee. PRTG Network Monitor is an all-inclusive, affordable and easy-to-use monitoring solution that allows you to monitor every aspect of your infrastructure: from LANs to servers, websites, apps and WANs. It measures real-time status and last access of all connected devices, traffic, load, and signal strength. Main features: real-time maps and dashboards for analytics, bandwidth monitoring, in-depth reporting, flexible alerting, Internet usage monitoring, remote distributed monitoring. Pros: prices are public and there are no hidden extra-costs; one license covers all features; the software is suitable for large as well as small businesses, scaling to networks of any size; other than measuring traffic, it is able to scan your network’s components to avoid issues; being user-friendly and intuitive, this solution is suitable for both IT professionals and non-expert users. Price: there are different editions according to the number of sensors clients need, whose prices vary accordingly. A 30-day free trial and a free edition (limited to 100 sensors) are available. Spiceworks is a simple to install and very intuitive to use network monitoring software. With Spiceworks, businesses can monitor what happens in their networks, servers and devices from one dashboard, in real time and in one place. Main features: bandwidth monitoring, Internet usage monitoring, real-time analytics, customizable alerts, Process and service monitoring. Pros: 100% free, unlimited devices, free support.